You may want to steer clear of eating too much beef jerky on your next road trip, limit the number of hot dogs at the next baseball game and cut back on the amount of salami at cocktail hour. Why? A recent study conducted by researchers at John Hopkins Medicine found a link between eating beef jerky and other processed meats and having manic episodes. This study examined more than 1,000 people. Some of the study participants had previous psychiatric disorders, while others did not. 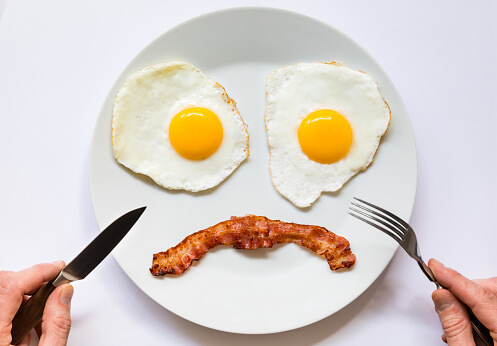 Despite mental health status, consumption of meat containing nitrates was associated with mania, an abnormal mood state characterized by hyperactivity, euphoria and insomnia. Mania is usually seen in people with bipolar disorder (which is characterized by periods of feeling very happy and then very sad), but it can also occur in people with schizoaffective disorder. Manic episodes are not to be taken lightly. A manic episode can last weeks to months and can lead to dangerous behavior and delusional thinking. Many people who have manic episodes may end up being hospitalized. It turns out that processed meats contain nitrates. Nitrates are food additives found in cured or processed meats such as bacon, ham and other deli meats, salami, beef jerky, sausage and hot dogs. They are used to prolong the shelf life of these foods by preventing the growth of harmful bacteria and help them maintain their color. Nitrates have also been linked to certain cancers (such as gastric cancer) and neurodegenerative diseases (such as Alzheimer’s and Parkinson’s). But to be clear, not all nitrates are bad. In fact, nitrates are actually naturally occurring compounds found in soil, water and plants. The human body even produces nitrates. Reportedly, 80 percent of dietary nitrates come from vegetables like celery, beets, cabbage and leafy greens. These dietary nitrates may even help reduce blood pressure. The problem appears to be with added nitrates, like the ones used in processed meats. Researchers of the study also experimented with rats and found that rats who were given a diet with added nitrates for just a few weeks exhibited mania-like hyperactivity. Manic episodes associated with mental health problems, like bipolar disorder, depression and schizophrenia, have been linked to genetics and other risk factors, but medical professionals cannot definitively say these risk factors are the cause of these mental illnesses. This is largely why researchers continue to see if environmental factors, like diet, are possibly a cause. This study emphasizes the need and importance of dietary interventions with people who suffer from mental illness. According to recent data, 1 in 6 Americans take a psychiatric drug (antidepressants being the most common). And 1 to 3 percent of the U.S. population is affected by bipolar disorder, and it costs an estimated $25 billion a year in direct healthcare costs! Demographic, health and dietary data were collected (keep in mind that some of the participants had psychiatric issues, while others did not). “We looked at a number of different dietary exposures and cured meat really stood out. It wasn't just that people with mania have an abnormal diet,” said one expert associated with the study. The study did not determine how much nitrate-containing meat could possibly cause problems, but if bacon is a regular breakfast food for you or you pack a sandwich with deli meat every day for work, you may want to consider some alternative meal options. Furthermore, the research with the rats showed that the amount of nitrates the rats were given (which appeared to cause mania) was equal to the amount that a human would have for a snack. It was equivalent to one beef jerky stick or a hot dog. In addition to this, in a separate study by some of the same researchers, they found that when people with bipolar disorder were given probiotics after a manic episode they were less likely to have to be rehospitalized in the following six months. Overall, more research is needed but we clearly cannot ignore the importance of what we are putting into our bodies. Other than avoiding or eating in moderation processed meats, how else can you be proactive about bipolar disorder or mania? Watch out for nutritional deficiencies. Thiamine (vitamin B1). A deficiency in this vitamin has been linked to emotional issues associated with bipolar disorder. Foods rich in this vitamin include beef, nuts, oats, oranges, eggs, legumes and peas. Niacin (vitamin B3). A lack of this vitamin may contribute to psychiatric and bipolar symptoms, including mental confusion, depression, anxiety, agitation, aggression and paranoia. Mushrooms, chicken breast, green peas, sunflower seeds and avocado are sources of this vitamin. Pyridoxine (vitamin B6). Not having enough B6 has been connected to symptoms of bipolar disorder and irritability. Salmon, potatoes, nuts, onions and spinach contain this vitamin. Biotin (vitamin B). Biotin helps turn the carbohydrates, fats, and proteins in the food you eat into the energy you need. A lack of biotin may also contribute to anxiety. You can find biotin in a variety of foods such as fish, eggs, seeds, nuts, sweet potatoes, spinach and broccoli. Folate (vitamin B9). A lack of folate has been connected to symptoms of depression and bipolar disorder. Spinach, asparagus, avocado, green peas, papaya and chicken breast are some foods that contain folate. Cobalamin (vitamin B12). If you don’t have enough B12 in your diet, you may be more at risk of having a manic episode. Vegans and vegetarians need to be especially proactive about getting B12, as this nutrient is mostly found in animal foods. Nori is a great plant-based source of B12. Vitamin C. A vitamin C deficiency has been linked to depression, bipolar disorder and irritability. There are so many delicious foods that contain vitamin C such as kiwi, strawberries, spinach, cauliflower, oranges and bell peppers. And don’t forget your minerals. There are a variety of minerals that if you get an adequate intake of, may help prevent or reduce the symptoms of depression and other mood disorders. To learn about these minerals, read here. Several studies have shown that consuming too much sugar may cause or exacerbate symptoms of mood disorders such as bipolar disorder. This may be due to sugar causing too much inflammation in the body, including the brain. Excessive drinking is not good for bipolar disorder, depression and other mental health issues. Abusing alcohol also depletes vital nutrients from the body. Not to mention it can lead to unhealthy, risky behaviors. It’s unbelievable what exercise can do for both the mind and body. Just one hour of exercise a week may help keep depression away. Exercise is also considered a viable form of treatment for bipolar disorder. Depression and bipolar disorder are not the exact same condition, but they are often grouped together because they may share similar symptoms. The main difference is depression does not have the “up” period that bipolar disorder does. Many of us suffer from nutritional deficiencies and don’t even know it. So we have to get a nutrient test to see if we are nutritionally balanced, meaning we have to make sure we do not have too much or too little of a certain nutrient. This allows us to work with a competent healthcare professional to tweak our diet and/or take quality supplements. And lastly, if you can’t give up your love of bacon, you may be able to buy some free of the food additive that may cause symptoms of bipolar disorder. In January, a northern Irish food manufacturer plans to release a bacon free of nitrates called Naked Bacon.